I am looking precisely at a coupling of a trifluoroborate with an aryl bromide. I know the mechanism of the Suzuki reaction, yet I cannot find any mention of the side products or degradation products that one could obtain if the coupling fails. Maybe those products are obvious for those who know well how palladium reacts, but this is not my case. I tried to find a book that would give me a feel for what might happen and could find anything close enough. 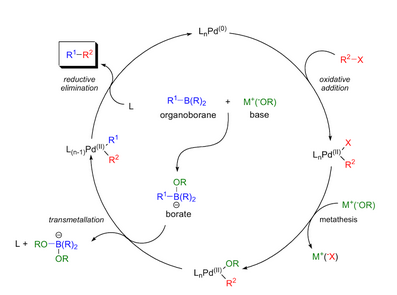 I'm expecting a protodeboration as a side reaction, yet I can't find any source nor mechanism. Could anyone shed some light on the subject? Organic Reactions (vide infra) explicitly states that complete hydrolysis of the trifluoroborates is necessary to allow successful transmetallation. Not the answer you're looking for? Browse other questions tagged organic-chemistry organotransition-metal-chemistry or ask your own question. What are the products in this SN1 reaction? What are the products of a bromination reaction? What are the products of the haloform reaction of acetylacetone? What are the products in this reaction? How do the electronic properties of a catalyst affect the rate of oxidative addition? How does the bite angle of a ligand affect the efficiency of its catalyst?